With my bag in hand, I was ready to leave the airport and get to my hotel for the night. While I was walking through Door 6 and headed towards the stop for Route 28X, I saw a bunch of people standing by the bus like they were waiting for something. As I got closer to the bus, I saw the driver close the door and pull away. A bit confused at that point, I wasn’t sure what had just happened. I overheard another passenger telling someone else that the driver was just pulling around. Looking at the schedule posted on the stop flag, this added up, so I figured I didn’t have much to worry about. A few minutes later, the bus pulled in to the stop again, and everyone started to board. 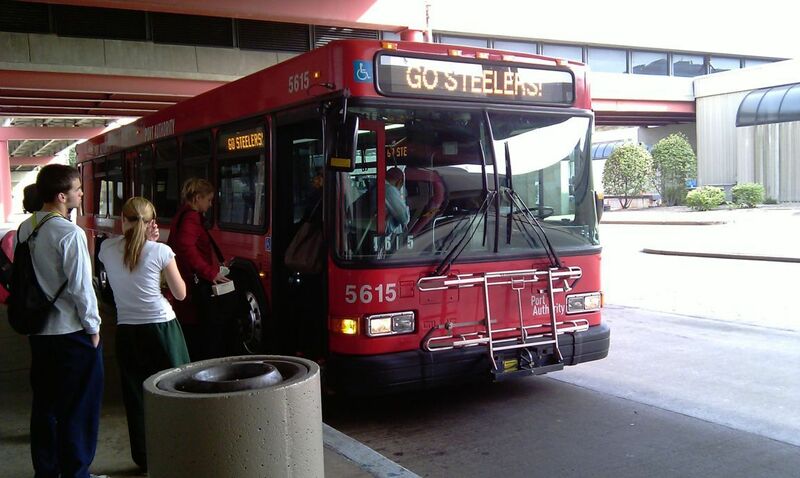 Before I’d even got to Pittsburgh, I’d taken a crash course on PAT’s fare structure. (Note that Port Authority of Allegheny County is often referred to as “PAT,” and that’s the name I’ll be using throughout this post.) Since I was at the airport, located in the far western edge of Allegheny County, I had to pay a 2-Zone fare of $3.25. With about $5 worth of quarters weighing me down, I figured it would be a good idea to pay my fare with them. I soon found myself regretting that decision when I stepped on to the bus and came face to face with the “VARE-point” farebox. A recent acquisition by PAT as part of the transition to the ConnectCard system (more on that later), the farebox is built by a German company called Scheidt & Bachmann. 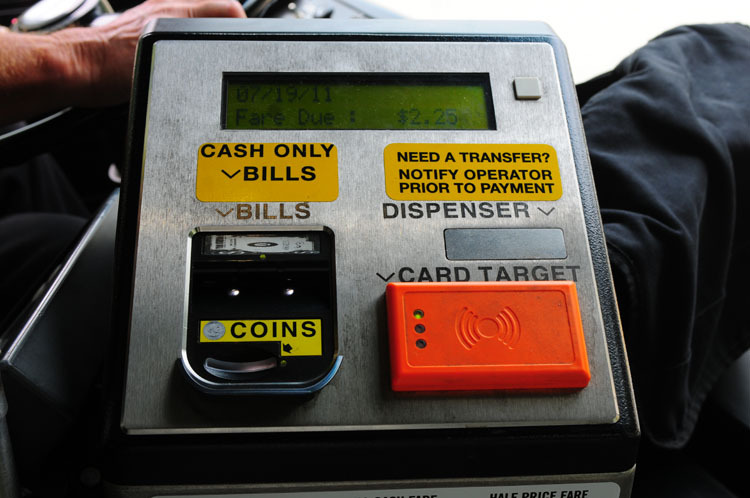 Before 2002, S&B had never built a farebox that could be used on buses and LRV’s. That changed when they won a contract with Boston’s MBTA to build their new fareboxes. A lot of the design was based on specifications S&B got from MBTA, and was later tweaked after several weeks of testing. Perhaps the most noticeable feature (or mistake, depending on who you ask) of the design is the bill/coin collector. Reminiscent of something you would see on a vending machine, the coin collector requires one to feed in coins individually, slowing down the already slow process of cash payments immensely. As I stood on that bus feeding 13 quarters in one by one, I could tell the driver was getting impatient fast, and the grumbles from behind me told me that the other passengers were doing the same. By my count, it took about 20 seconds from the moment I first stepped up to the farebox to the moment my last quarter was accepted by the farebox. On an individual basis, this may not seem like a big deal, but those 20 seconds add up fast when there is more than one passenger paying with cash at the same stop. At the airport stop, there were about 15 people boarding, with about 6 or 7 paying in cash. For this reason and many more, it became obvious fast that PAT needed to find a way to get passengers away from paying by cash. 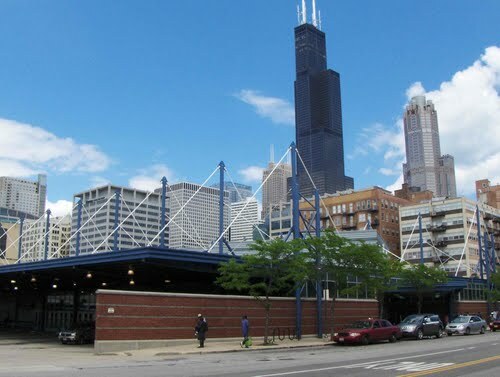 At the end of Part 1, I had just arrived in Chicago for a 6-hour layover in the midst of my coast-to-coast bus ride. This is the conclusion of the story. With 6 hours to kill in the Windy City, I had to decide if I wanted to go play tourist for a short while or just take it easy. I went with the latter. Outside at the front of the station, I found a place to sit and eat a small lunch consisting of Triscuits, granola bars, and an Arizona Mucho Mango while watching people walk by. The thing that struck me as most interesting was that there was actually “life” on the street. People were walking by with their dogs, or riding their bikes, or heading home from the office. 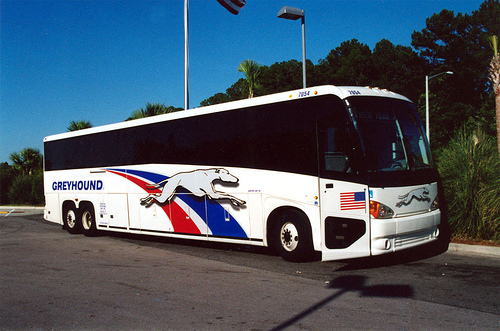 All too often, it seems that Greyhound locates their stations in run-down, dead areas of cities that nobody wants to go to. In modern times, that seems to be changing, and in the case of Chicago, it’s worked out quite well. Since it had been almost two days since I was last able to get in contact with anyone, I decided to go wander over to the library. Luckily for me, it was rather close by. Per the directions from Google Maps, it’s a 0.9 mile walk that takes 19 minutes. In all honesty, it felt a lot shorter than that, even though I was hauling along a 30lb backpack. To be fair, it’s probably because I like Chicago. As I walked along I couldn’t help but marvel at all the different buildings and architectural styles, while at the same time reminiscing about things I remembered from the last time I’d been to Chicago. When I first landed in Tampa on March 5th, I was only planning on staying for a few days. At most, I figured I would be there for a couple of weeks. Though the story gets pretty complicated, let’s just say that due to a series of events beyond my control, I ended up staying for a while. 143 days to be exact. While I will admit that Tampa grew on me (apart from the humidity), and I enjoyed getting to hang out with Jason (@yobusdriver3507) on the bus all the time, I knew it was time to return to the Pacific Northwest. With the limited resources I had at my disposal, I was left with a choice: Fly, or take a bus. Care to take a guess at which option I went with? On Thursday, June 28th, I had the chance to go west across Tampa Bay to the other side of the metro area, in Pinellas County, to ride the local transit agency, Pinellas Suncoast Transit Authority (PSTA) and see how things operate over there. Joining me (or rather, leading the journey) was fellow transit nerd and HART bus driver Jason Eames, aka @yobusdriver3507. Starting our journey at Marion Transit Center in downtown Tampa, we boarded PSTA’s Route 100X. This route, along with PSTA’s other express route, 300X, are operated with a fleet of 10 2003 MCI D4500’s. My memory fails me a bit on this detail, but I believe we rode on unit #2307. While enroute to the western terminus, Gateway Mall, I mainly just watched the road and enjoyed the scenery, as this was the first time I’d ever been across the Gandy Bridge. Jason chatted with the driver about bus driver stuff (for lack of a better term) in the meantime. Other than us, there was just one passenger onboard the bus. (While the bus runs in both directions, the peak emphasis is on Tampa during AM and Pinellas County during PM). At Gateway Mall that other passenger disembarked, while we remained onboard, as the bus driver had kindly offered to let us remain on while he deadheaded back to PSTA’s base. Earlier this week, I shared the news about a brand new bus route linking the cities of Yakima and Ellensburg (click the link to see the schedule and map at the end of the post). Since its way more fun to actually ride the bus and see it in person instead of just writing about it, I decided I would go ride it. But to make it more interesting, I decided that I would ride the bus to the bus. (Get it?) The following is a recap of everything that happened, along some photos I took along the way.